It's deploying a feature to compete with its rivals, like Coffee Meets Bagel. In 2015, Tinder introduced a new feature called the "Super Like." We all know you can swipe right to let a user know you're interested. But if you're really interested, that's where the Super Like comes in. Swiping up meant you Super Liked a person. 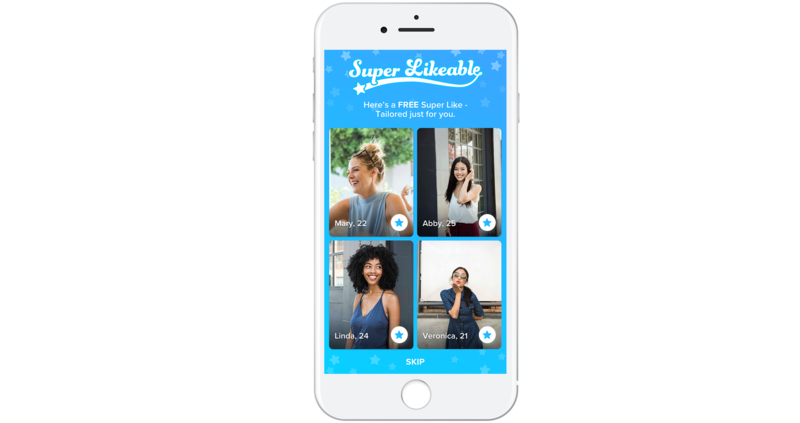 Now, Tinder is launching a new feature called "Super Likeable," and it uses AI to figure out who you're likely to Super Like. Users are limited to using Super Like once a day. But Tinder's AI will present you with four different people it thinks are worthy of your Super Likes. You'll get one free Super Like to use on one of these Super Likeable people. Users have no say over when Super Likeable people appear to them, and you can't go out and find them; it's just a feature you'll occasionally find while using Tinder. It's worth noting that this feature is similar to the way one of Tinder's rivals works: Coffee Meets Bagel delivers matches it thinks you'll like every day. The feature is currently limited to users in New York and Los Angeles, but it will likely roll out to the wider Tinder audience soon. It will be interesting to see how spot-on the AI actually is in regard to the people it thinks users will Super Like.